If you are after an affordable Seiko that is a notch above the entry level Seiko 5s, then Presage is definitely the collection to look at. Presage takes the baseline Seikos and add more finesse, craftmanship and quality parts to what is always a quality offering by Seiko. And this has been Seiko’s intention since they started making them many decades ago. The SARY057 is a fine example of this as it looks similar to the Seiko 5 SNKL23 I recently reviewed, and even closer to the SARB033 but, both are a lot smaller on the wrist being under 40mm. A simple, pure glossy black dial with striking silver accenting is how this watch shines. It smacks of dress watch class from the outset. The applied hour markers have a tapered tip with rounded back, being thicker for the 6, 9 and 12 o’clock. With the day/date at 3 o’clock Seiko has opted for just a hint of a marker next to the window. The minute train around the case edge is extremely fine, giving portions of a second in detail. Although hard to see on this straight on image (better on the second image), it actually sits at an angle giving a ramp up towards the edge of the case. The hands are sword shaped like many a dress watch, with sharp ends at the base. The second hand is a simple sliver taper to a sharp point. The day/date window is in matching black with white lettering, although some reviewers have complained it is hard to see in low light. I can see why. However, I would argue that looking great is more important, especially since you only check the date at most once a day! 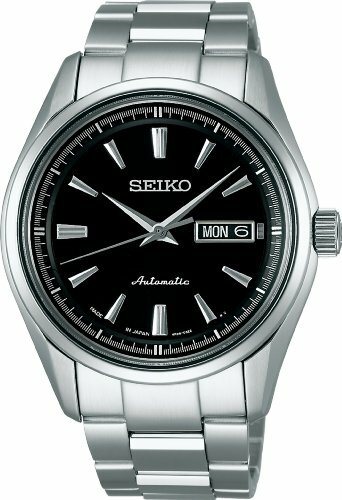 The final details on the dial are the Seiko Logo, of course at 12 o’clock, looking the part with joined lettering, and the script “automatic” at 6 o’clock adding yet another element of “dress watch” class to the watch. Seiko has put a lot more effort into the case and bracelet finish on this watch. Perhaps I should not be surprised given it’s a Presage and not a Seiko 5. But for not much more money, it’s fantastic to see. The bezel around the sapphire crystal (also surprising at this price point) is polished stainless steel, with the rest of the case alternating between polished and brushed – with brushed on the side facing us in the image. The crown as a Seiko “S” signature, which is a nice touch and gives you access to the hacking and winding movement. Which, you can clearing see in the display back with the elegant gold movement rotor showing the 21 jewel automatic 4r36 movement from Seiko. The bracelet is your typical oyster style and completely brushed on the main parts, and polished on the sides. It has a decent stamped clasp with double-button safety and a Seiko signature on the clasp top. The only downside on this particular bracelet is the lack of much fine-tuning holes on the clasp. There are only two positions as you can see in the image, so if you are unlucky to be between sizes, you might not have a great fit. Another major thing to point out is that this watch measures 41mm in diameter, so might be a little large for smaller wristed people like me. In that case head to the SARB033 model. I have already give away all the specs on this above, but let’s recap just in case. The Seiko 4R36 is a great mid-level movement from Seiko that has not only 24 jewels, but also features hacking and winding. The power reserve is also near two days at 41 hours and it runs at 21600 beats. Water resistance is good to see at 100m (330ft) meaning you can definitely get this watch more than just a splash wet. You might even be able to take it for a swim. Personally, given swimming involves either salt or chlorine in most cases, I still would not, but it’s good to know it’s protected. Who Is The SARY07 Going To Be Great For? This watch is not bottom end by any means, but you get a huge range of high quality parts for a very affordable price in this watch – the movement, water resistance, sapphire glass and all stainless steel case and band. It’s a great looking dress watch that will suit a larger wristed person and be good for work, out on the town, or with the addition of a different strap, something less formal. Either way, you can hardly go wrong with a Presage from Seiko at this price point.